Fitness Club Vertical Climber is a solid and functional home gym fitness equipment with a compact space-saving design. It is a climbing machine and a stepper that mimics the rock climbing and that will get all your muscles involved- upper and lower body as well as abdominals. Fitness Club Vertical Climber offers a total body- both cardiovascular and resistance workout and helps improve your endurance and strength over time. It is an efficient stepper that will help anyone burn calories and fat and get in shape by regular use. With any fitness equipment or program, you start with an continue, you need to have a healthy eating plan as well. And it is a good idea to ask your health care person for advice if you suffer from any related conditions that may be potentially affected by your exercise routine. It comes with the isometric non-stick grips that you’ll hold while you’re working on all the main muscles in your body and enhance your heart health. There is even a small digital workout screen with a red button underneath which shows the calories speed, distance and time. People of different heights can use it comfortably as it is easily adjustable for height. The shipping weight is 37 pounds, it is lightweight despite having a sturdy cold-rolled steel frame with double support rod at the back. It has a foldable design which makes it easier to relocate and store. It offers a very intense type of workout, which you will notice from the first time you get on the textured pedals and will work your core section, calves, thighs, buttocks, shoulders, triceps, biceps and more. So it is an effective aerobic and strength training unit that is both safe to use and powerful overall. It may be ideal for those that are short on space in their flats, as it doesn’t occupy a lot of space with its vertical design and small footprint as well as the fact that you can simply fold it and move it away. But there are no transport wheels that we can see in the photos. The home fitness market is more popular than ever before, because of people’s busy schedules and professionals working long hours at work. And you’d be familiar with various types of fitness products including treadmills, exercise bikes, ellipticals, step machines. And now the vertical climbers which we believe beat the rest in terms of challenge, the benefit to the body, simplistic design and low cost. So the price to performance ratio is very low for the vertical climbers, which means they have the ability to deliver outstanding performance for their lower price point concerned. 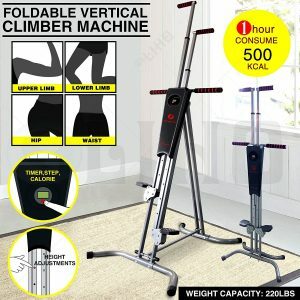 And the Fitness Club Vertical Climber seems like a very good value product too.